Most trees have leaves in shades of green that only turn shades of red, orange or yellow in the fall. But a few unusual trees have leaves that start out and stay red year-round. Red leaf trees can add interesting contrast to a yard or garden, or be used as a bold boundary line. Be sure to do your research before planting a red tree on your property; depending on the time of year or climate, some red leaf trees look more deep burgundy or even brown. 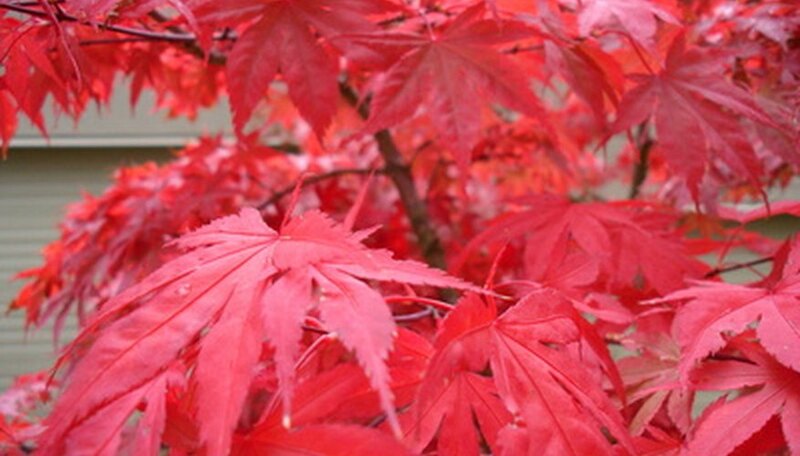 Identify a Japanese maple by its red leaves that get brighter in autumn. The leaf of Japanese red maples has seven lobes that are deeply cut and pointed on the ends. Bloodgood Japanese maple (Acer palmatum 'Bloodgood') and Japanese red maple trees (Acer palmatum 'Atropurpureum' spp.) are commonly used in landscaping for their red color. Identify a red plum tree by its simple oval-shaped leaf with fine, sharp teeth. "Thundercloud" Red Leaf Plum Tree (Prunus cerasifera 'Thundercloud') is a good species of red plum with copper red leaves. Identify a Crimson King (Acer platanoides), a variety of Norway maple, by its broad purple-red leaf with seven thick, toothy lobes. The leaves of the Crimson King turn dark maroon to bronze in the fall. When Do Trees Change Color in Helen, Georgia?